Filming is expected to begin on the production in Dublin’s north inner city on Tuesday afternoon in both Talbot Street and Spencer Row. The new Irish crime series is based on Tana French’s ‘Dublin Murder Squad’ novels, which is being adapted by Sarah Phelps for the BBC. 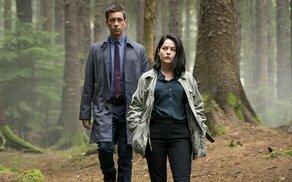 The psychological crime thriller will be led by Irish duo Killian Scott (‘Damnation’) and Sarah Greene (‘Rosie’) who will play detectives Rob Reilly and Cassie Maddox, and is set to feature on BBC One and RTÉ with support from Northern Ireland Screen. US Network Starz also acquired the rights for the series in December. The series, set during the height of the Celtic Tiger financial boom of the millennium, will focus on two murder investigations led by ambitious and charismatic Detectives Rob Reilly and Cassie Maddox. When Reilly and Maddox investigate the murder of a young girl found in a dense wood on the outskirts of Dublin, the pressures of the case push their relationship to breaking point. ‘Dublin Murders’ boasts a strong Irish cast that includes Tom Vaughan-Lawlor as Frank supported by Moe Dunford as Sam, Leah McNamara as Rosalind, Ian Kenny as Phelan, Eugene O’Hare as Quigley, Jonny Holden as Damien with Conleth Hill as O’Kelly and Peter McDonald as Jonathan. Lead director on the series is Saul Dibb. ‘Dublin Murders’ is due for release later in 2019.